Windows 10 will get better in the forthcoming Creators Update. That isn’t a hollow promise or more marketing drivel. It’s a straightforward observation, comparing the most egregious parts of the current version, Win10 1607 Anniversary Update, with near-final betas of the next version, 1703. While it’s too early to gauge 1703’s stability, the feature improvements are very real. Windows 10 beta build 15031, which appeared on Feb. 8, was the first Win10 build in the rs2_release branch. That’s the point where a fork in the Win10 beta process started honing in on the “final” release of Windows 10 Version 1703, the Creators Update. The last major change we’ve seen came in build 15042, on Feb. 24, with the unveiling of a new disappearing Pause Updates pane in the Settings app. Since that point the changes have been largely cosmetic, with bug fixes taking center stage. Of course we’ll be talking about the Creators Update in the coming weeks and months as the bugs get ironed out. But there’s a big picture lurking that’s crucial for many admins, Win10 owners, and Win10 maybe-wannabes. As Eric Knorr notes in “Which Windows 10 should your business install?,” if you’re thinking of moving to Windows 10, now’s the time to do it. The current version, the 1607 Anniversary Update, is the most stable and obvious choice, and it will remain so for many months. But real improvements lurk in 1703. You should know about them. Here are the five complaints about Windows 10 Anniversary Update 1607 that I hear most often. Let’s take a look at how things stand now and how Windows will evolve in 1703. Keep in mind that 1703 won’t be “business ready” when it’s first available (likely in May). If you need Windows to work all the time, it’s much smarter to wait until 1703 matures sufficiently to enter prime time (what Microsoft calls Current Branch for Business), which will likely occur in August or September. Here’s where we stand with the biggest complaints—and where we’re headed, sooner or later. The top complaint among experienced Windows users? The way Win10 pushes updates. You have no choice in which updates to apply: They’re all cumulative, and you get everything Microsoft wants to push. More damning, unless your PCs are attached to an update server, you have very little control over when the updates appear. I’m talking about the security and nonsecurity patches—the bread-and-butter cumulative updates that appear every week or every month. I’m also talking about “feature updates,” which are entirely new versions of Win10 that roll out every eight months or so. As long as all of Microsoft’s patches are good, it’s a moot point. Patch away, Microsoft, and raise our computers to a better level. 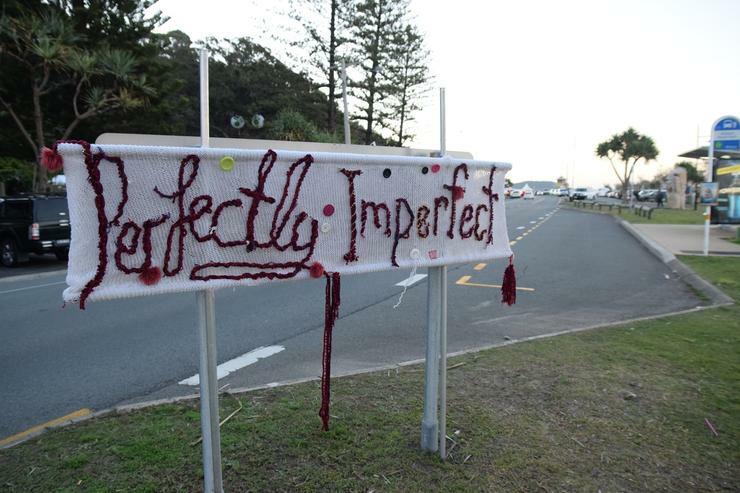 But no matter how rosy your glasses, the patches aren’t always all good. It’s wise to sit back and wait to see if any real stinkers appear in the cumulative update rollouts. Right now, very few tools enable you to wait, unless you’re attached to an update server. You generally get the patches when Microsoft decides to send them out. Current Version 1607: Windows 10 Pro has poorly documented control over updates buried in a Group Policy setting. Step 1. In the Cortana search box, type gpedit and press Enter. Note that this only works in Win10 Pro and Enterprise; Win10 Home doesn’t have the Group Policy Editor. Step 2. On the left, navigate to Computer Configuration > Administrative Templates > Windows Components > Windows Update > Defer Windows Updates. On the right, double-click on Select When Quality Updates Are Received. Step 3. 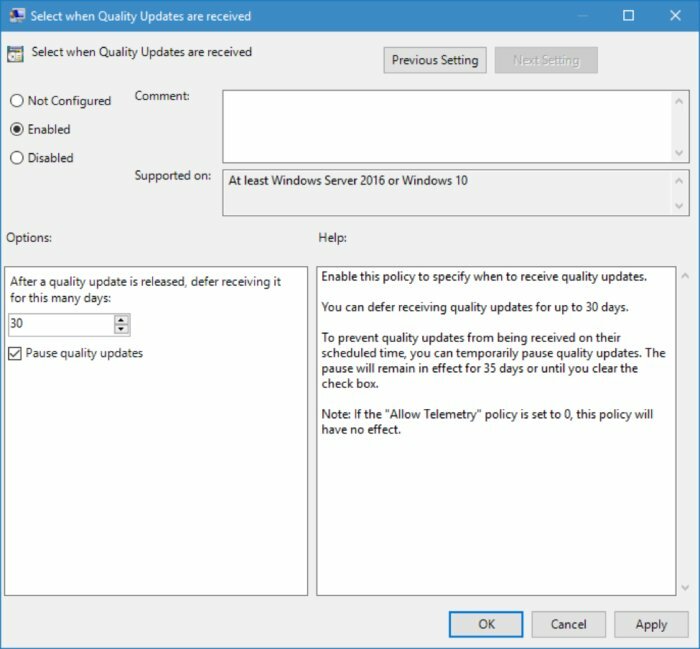 In the resulting Group Policy panel (see screenshot), click the radio button marked Enabled, then check the box marked Pause Quality Updates. Click OK.
Based on the latest documentation, dated Jan. 30, it looks like Pause Quality Updates will stop the clock for 35 days, but the docs don’t say if the number in the numeric box in the Group Policy overrides the pause, if the pause overrides the number, or some combination of the two. Bottom line: You can delay cumulative updates for a month or so. Beyond that, the documentation isn’t clear. To reset the clock, you need to disable the policy, click Apply, then enable it again. 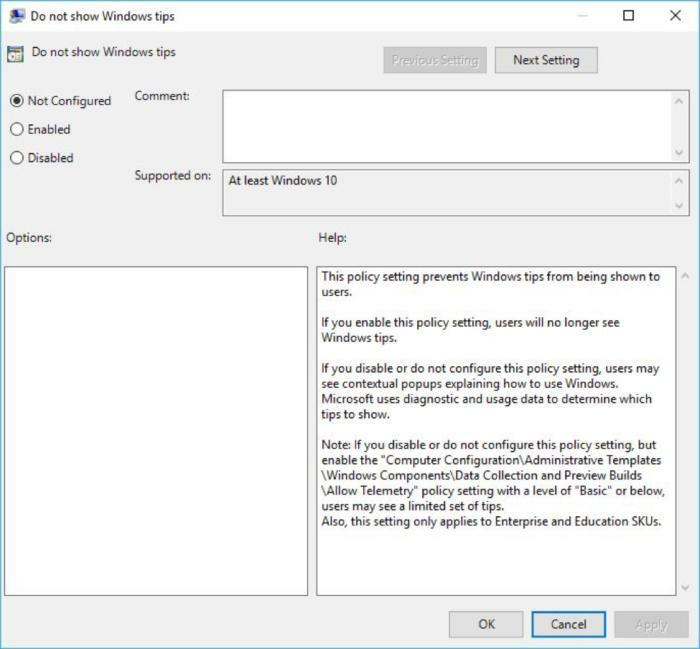 I explain the Allow Telemetry policy mentioned in the Group Policy in my November article on blocking forced Win10 updates. Win10 Home 1607 has no Group Policy editor and, as best I can tell, no access to a registry setting that would provide a similar delay. That means Home users have to dig deeper to prevent cumulative updates from installing as soon as they’re released. The “metered connection” setting tells Windows that you have to pay for your internet by the bit. Windows won’t automatically download any updates—Windows updates, app updates, Office updates—when you’re on a metered connection. Other apps may or may not use a metered connection. OneDrive may request permission to sync over a metered connection. That may or may not be a showstopper on your machine. Step 1. Click Start > Settings > Network & Internet. Step 2. On the left, click Wi-Fi. Click Manage Known Networks. Step 3. Click on your current Wi-Fi connection and click Properties. You see the dialog box in the screenshot. Step 4. Shift the Set as Metered Connection slider to On. The metered connection trick to disable forced cumulative updates is a kludge at best, but it’s the best compromise I’ve found. For Win10 Home customers with wired internet connections, you have few choices. Feasible alternatives: Upgrade to Win10 Pro ($100); install a Wi-Fi adapter ($30, but slows down your connection); hack your Ethernet connection so that Win10 will let you convert it to “metered”; or turn off the Windows Update service, which I don’t recommend. Future Version 1703: Microsoft heard the loud complaints from those of us who don’t trust forced patching and has made delaying cumulative updates much simpler for Win10 Pro customers. 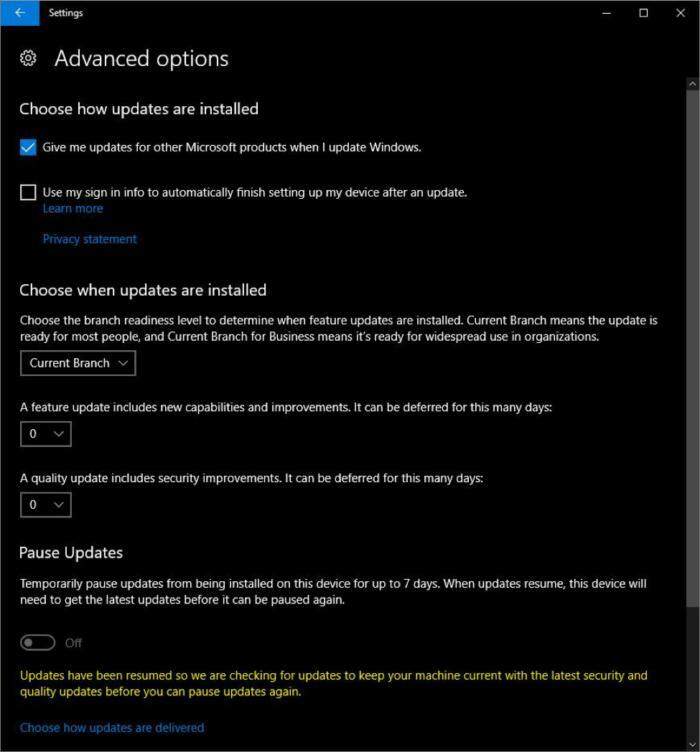 Starting with Version 1703, you will be able to pause updates from the Windows Settings app (see screenshot). If the feature makes it all the way to the final version of 1703, you’ll also be able to tell Windows Update to wait for “Current branch for business” status, pause all updates, and/or wait a specified number of days before applying Feature (version) or Quality (cumulative) updates. To get to the setting, you don’t need to use the Group Policy editor. Instead, you click Settings > Update & Security > Windows Update > Advanced Options. In some situations, the Choose When Updates Are Installed part of the dialog disappears. You can usually bring it back by manually checking for updates, then sliding Pause Updates to off, with a possible reboot in between. 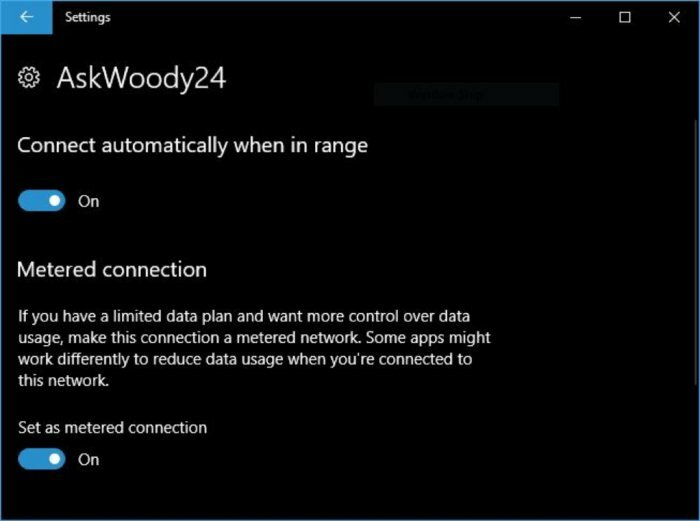 Although Microsoft still won’t provide a cumulative update “pause” switch for Win10 Home users, they do get a sop: Effective with 1703, wired (Ethernet) internet connections can be designated as metered. We don’t know what information Microsoft collects on Windows 10 machines, and it’s highly unlikely we’ll ever find out. Microsoft collects telemetry, as it readily admits, and it has for decades. We have no way to know what kinds of telemetry are being gathered and whether that telemetry is being used for purposes you or I might find objectionable. If you trust in Microsoft, skip this section—move along, folks, there’s nothing to see. Personally, I prefer to cut the cards. We collect data about the features you use, the items you purchase, and the web pages you visit. This data includes your voice and text search queries or commands to Bing, Cortana, and our chat bots. 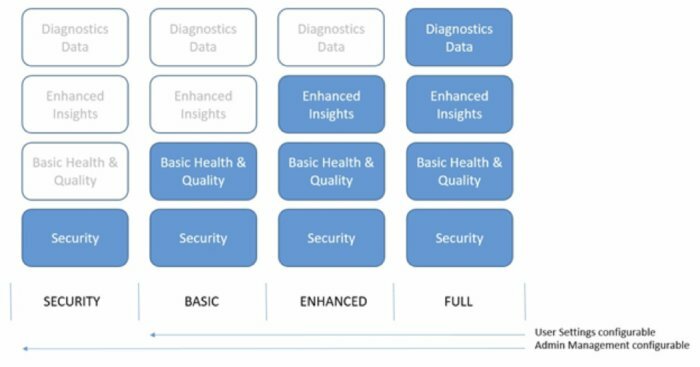 Microsoft has a more detailed view of what kind of data it collects in Brian Lich’s TechNet post “Configure Windows telemetry in your organization.” There, you can see the diagram of the kinds of data Microsoft collects (see screenshot). As Microsoft supporters are quick to point out, Microsoft claims it anonymizes personally identifiable information, and only the anonymous info is retained. Much hinges on the method of anonymization, of course, and how Microsoft uses the presumably discarded original telemetry reports. There’s an enormous body of scholarly research on anonymization and an equally voluminous body of articles showing skepticism about its implementation and effectiveness. Current Version 1607: Turning off all the privacy settings in Windows 10 is notoriously complex, and that includes only the settings you can get to in the Windows user interface. 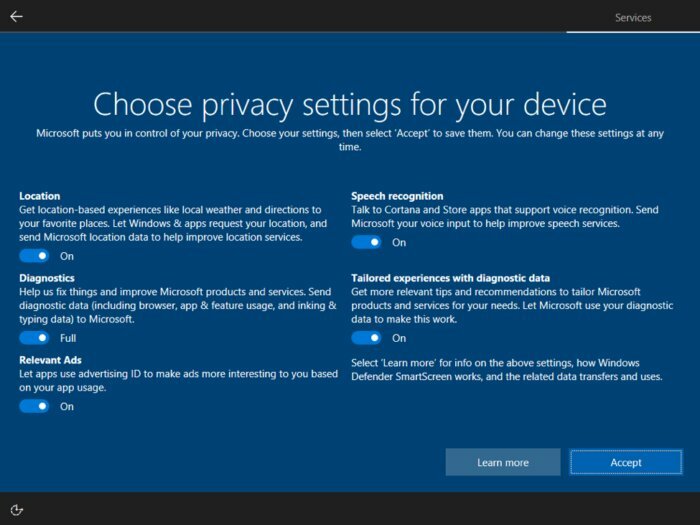 If you want to go down that rabbit hole, start with Ed Bott’s lengthy (and frequently changing) “Take control of your privacy in Windows 10 guide” at ZDNet. If you want to burrow into the hole even deeper, try Rob VandenBrink’s “Making Windows 10 a bit less ‘creepy’” at the SANS Internet Storm Center. Short version: Nobody knows how to turn off Windows 10 snooping, but with a lot of work and diligence you can put a dent in it. 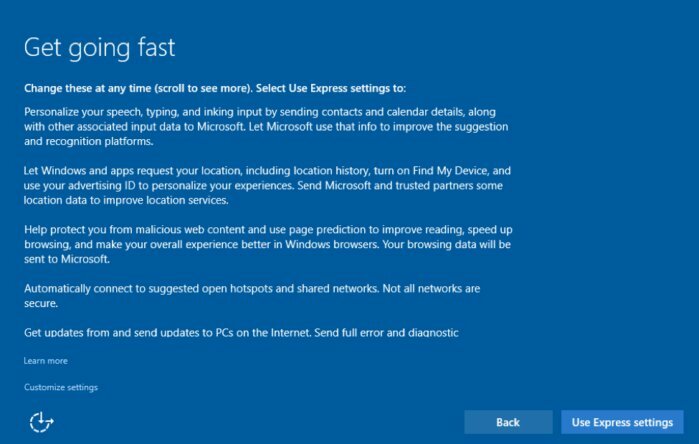 One universal source of scorn: The 1607 installation sequence includes a Get Going Fast page (see screenshot) that encourages Win10 users to accept Microsoft’s preferred privacy predilections and select Use Express Settings. If you choose the link to Customize settings (on the left), you’re presented with five additional screens that let you adjust a wide range of privacy settings: 16 in all. Few people bothered. The approach (and Microsoft’s data collection in general) was so egregious that the Electronic Frontier Foundation, the Swiss Data Protection Commission (FDPIC), and the French National Data Protection Commission (CNIL) all raised questions about it. Future Version 1703: In mid-January, Windows honcho Terry Myerson announced “a new privacy set up experience, simplifying diagnostic data levels and further reducing the data collected at the Basic level.” The web-based privacy dashboard Myerson promised has been implemented; it’s available today. I talked about the changes in “Reality check: How Windows 10’s new privacy controls stack up.” The EFF, FDPIC, and CNIL all backed off a bit. The old User Express settings brushoff in the initial setup has disappeared. The setup routine for build 15025 (the latest official build that can be set up from scratch) now contains a screen for privacy settings (see screenshot), and they can’t be bypassed with a Default Settings button. That’s a significant difference, although it isn’t clear at this point if everyone upgrading from 1607 to 1703 will have the opportunity or requirement to re-examine their privacy settings. I’m waiting for the final version of 1703 to connect the dots. We’ll see how the settings on the new setup screen maps onto the Windows Settings panel and to see if Microsoft provides a way to rerun the Choose Privacy Settings wizard for your PC’s setup routine. Microsoft’s advertising has become much more aggressive. This no longer is just puffery for Microsoft products in limited locations, like a nag balloon that says “Switch to Microsoft Edge for up to 32% better battery life” or advertising for OneDrive in File Explorer (see screenshot). The advertising changes are coming across the board, in many on-screen locations and covering plenty of non-Microsoft products. We aren’t yet to the point of ceding huge hunks of screen real estate to the highest bidder, but the wheels are in motion. Current Version 1607: Ads are springing up all over the place. Advertising on the lock screen. 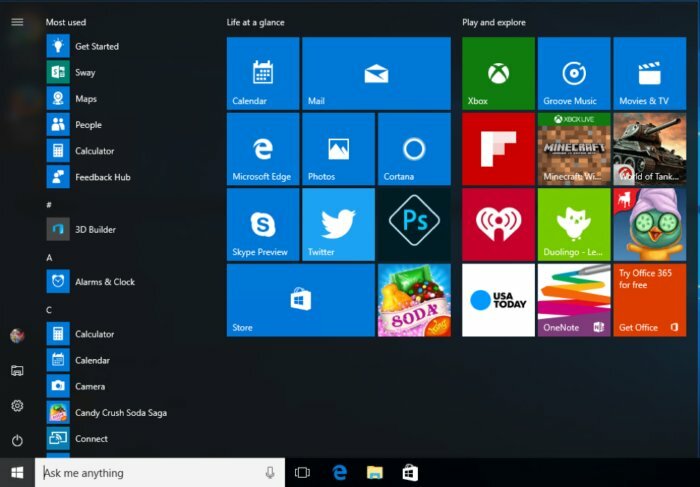 Start menu app “suggestions,” including Candy Crush Soda Saga on Win10 Pro PCs. Unwanted Start tiles, including Food & Drink, Groove Music, Flipboard, and a plethora of other seemingly random tiles (see screenshot). Other Windows tips that appear in Toast notifications and pop-ups, with “helpful” information about how Microsoft’s products are better than rivals’. None of the offensive applications are installed, mind you. The tiles you see are advertising links that connect to downloads for the products in question. In earlier versions of Windows 10, admins using Group Policy could wipe out most of those advertisements. In Version 1607, Microsoft changed the ad-blocking capability. Starting with Win10, Windows 10 Pro users and admins can no longer block tips and tricks and Windows Store suggestions using Group Policy. 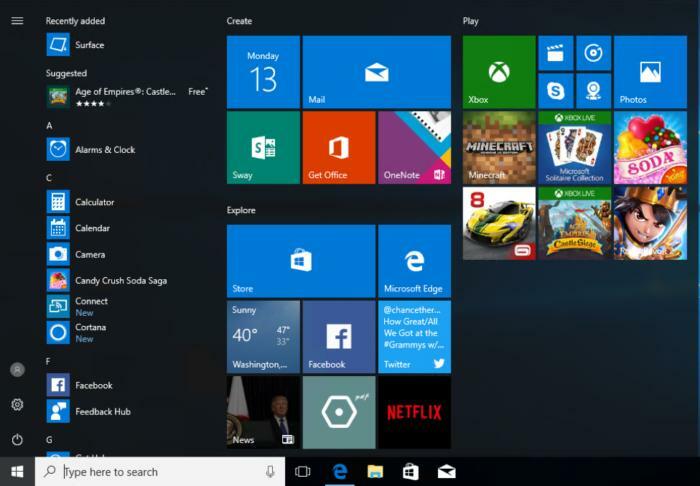 Win10 Enterprise retains the capability. Future Version 1703: The ads aren’t getting any better. In the most recent build of 1703, some of the default Start tiles have changed (Facebook, Royal Revolt 2, and Forza 8), the Suggested entry on the Start menu is populated (Age of Empires Castle Siege), and Candy Crush Soda Saga continues to stand as a salted entry on Start. Again, the apps aren’t installed; they’re only taking up real estate. Version 1703 continues to block the Group Policy settings that used to help you avoid Windows tips (screenshot). The old policies, which don’t work in 1703, are in the Computer Configuration > Administrative Templates > Windows Components > Cloud Content branch of GPedit. It’s easy, if time-consuming to delete the offensive Start menu tiles. In 1607, installing cumulative updates would bring back the tiles. It’s not clear if 1703 will continue in that boorish tradition. You can manually turn off the Spotlight advertising on the lock screen, by using Start > Settings > Personalization > Lock Screen > Background and choosing a Background (lock screen picture) other than Windows spotlight. You can manually turn off Suggested Apps in the Start menu by clicking Start > Settings > Personalization > Start, then turning off the Occasionally Show Suggestions in Start slider. To remove unwanted Start tiles, right-click on them one by one and choose Unpin from Start for each. Most (but not all) of the tips can be disabled by clicking Start > Settings > System > Notifications & Settings. You can turn off any of the listed kinds of notifications, but the two you definitely want to turn off are Get Tips, Tricks, and Suggestions as You Use Windows and Show Me the Windows Welcome Experience after Updates and Occasionally When I Sign in to Highlight What’s New and Suggested. I know of no way to disable the helpful balloon tips that tell you, inter alia, Edge is 21 percent superior to Firefox. Stability is a problem when any new version of Windows 10 appears. That’s not a result of Microsoft’s intransigence. It’s by design. Current Version 1607: It took Anniversary Update about four months to become stable. A frighteningly large number of Windows customers don’t understand that’s the way it’s supposed to work. Version 1607, released on Aug. 2, 2016, wasn’t deemed ready for business customers until Nov. 29, a span of 120 days. Future Version 1703: Expect more stability problems until 1703 reaches the so-called Current Branch for Business (CBB) status. It would be wise to avoid updating prior to the CBB date, which is expected to take about four months from the date 1703 is released in “final” form to the masses. Throughout its history, Windows 10 has gained a nasty reputation for changing users’ settings. Current Version 1607: Users made no end of complaints when the installer switched many user settings. Default file associations for pictures, videos, and songs got changed. The default browser was changed to Edge. PDFs were handled by Edge, no matter what you had set before. Old mail programs got clobbered, replaced by the Windows Mail app. 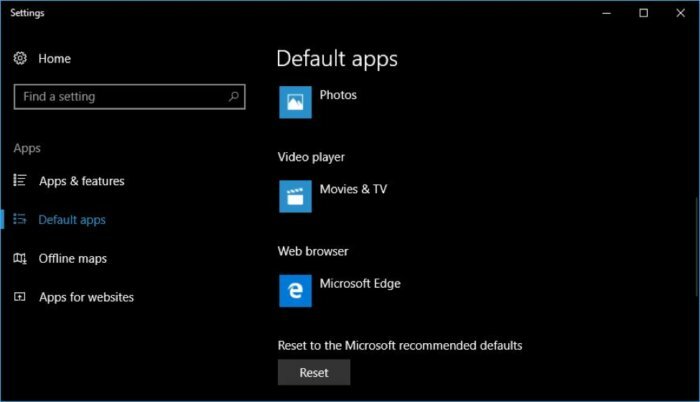 You can change many of those associations by going to Start > Settings > System > Default apps, but you may have to mess around with individual defaults by clicking Choose Default Apps by File Type, Choose Default Apps by Protocol, or Set Defaults by App. You can also change the default associations by right-clicking on a file and choosing Open With > Choose Another App, but why should you have to? 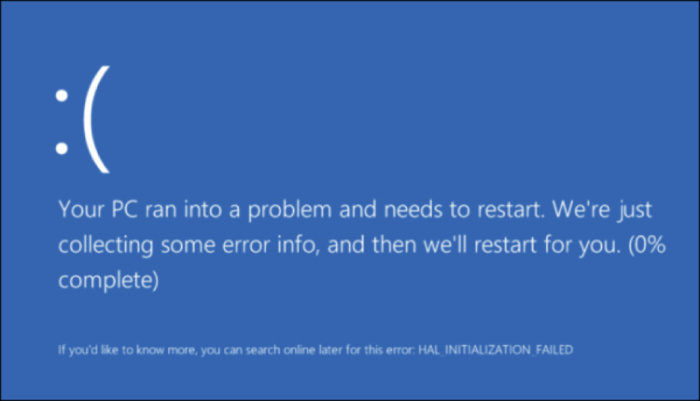 Future Version 1703: Microsoft is, as they say, “aware of the problem.” I haven’t hit any egregious setting hijacks in the course of testing many recent beta copies of 1703 in a multitude of situations. Hope springs eternal. Blocking updates will be easier for Pro users, but Home users in 1703 will still be treated like cannon fodder. It will be easier to choose antisnooping settings, but it remains to be seen if the quantity and nature of telemetry data nudges the meter. Advertising will get worse, with fundamentally no change in settings, as part of a widely anticipated and recently witnessed push to get the cash register going. Stability of the initial version of 1703 won’t be great until millions of unpaid testers take a swing and Microsoft declares 1703 CBB. Hijacked settings should be much less common. If the betas we have right now hold true, Creators Update 1703 will offer worthwhile improvement to several of the most-maligned parts of Anniversary Update 1607. Give it a few months to settle down and reach CBB status, and you’ll be looking at a better version of the last version of Windows.